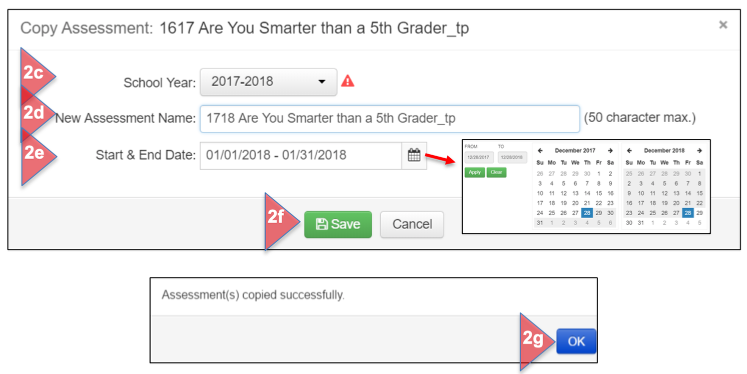 Assessments created in SchoolCity Suite during a school year may be copied and used again during the same or next school year. Assessments of any status may be copied - unpublished, published, in progress, or closed. This document will explain how to copy a single assessment as well as multiple assessments at one time. From the Top Menu Bar, select Assessments (1a). In the Assessment Manager, select the tab under which the assessment you wish to copy is housed (My Assessments, School, District) (1b). Check the box next to the Item Bank assessment you would like to copy. Click on the Copy icon located above the Functions header. 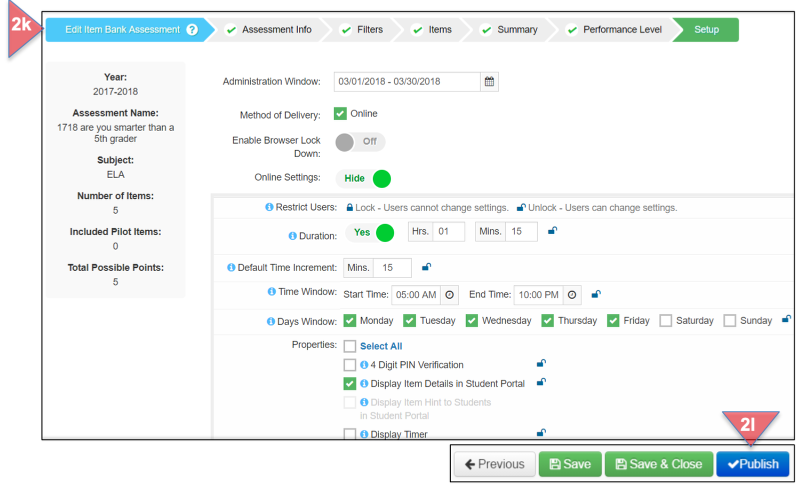 In the Copy Assessment window, select the desired School Year for your new assessment. Give the new assessment a unique Name. Select the Start & End Date the assessment will be available to students (Assessment Window). Click on the calendar to change the dates, then click on Apply. Click Save to complete the copy process. A message will appear confirming the copy process. Click OK to continue. In the Assessment Manager, if you have copied the assessment to the same school year, it will be unpublished and the test documents will be unavailable (folder icon is closed). To publish the assessment as is, and place the test documents in the folder, click on the functions down arrow and select Publish. To make revisions to the assessment and then place the test documents in the folder, click on the gear icon to return to setup. You may make revisions in any step of the setup process by clicking on the name of the step. Once you are done, click on Publish in the last step, Setup. If you copied the assessment to the following school year, you must select that school year in the drop down box in the Assessment Manager. Note that the assessment cannot be published until the roster file for this school year has been uploaded. Check the box next to the assessment you would like to copy. Include test documents/Exclude test documents: Determine if you want the PDF of the assessment and any other accompanying documents to be included in the copy or not. 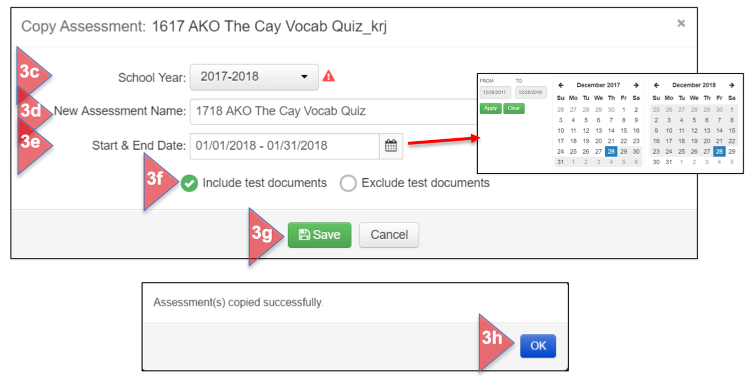 In the Assessment Manager, if you have copied the assessment to the same school year, it will be unpublished and if included, the test documents will be located in the folder icon, shown as open. Select the desired School Year for your new assessment. Determine the Start and End Dates the assessment will be available to students (Assessment Window). Click on the calendar to change the dates, then click on Apply. Append Prefix and/or Append Suffix and/or Replace words/numbers, depending on your naming protocol. Include test documents/Exclude test documents: If desired, AKO and Express assessments with attached PDFs can be included in the copy. Item Bank documents will not be included in the copy, but once the copy is published, the test booklet and summary documents will be available in the folder icon (See Step 2). A message will appear confirming this action. Click OK. 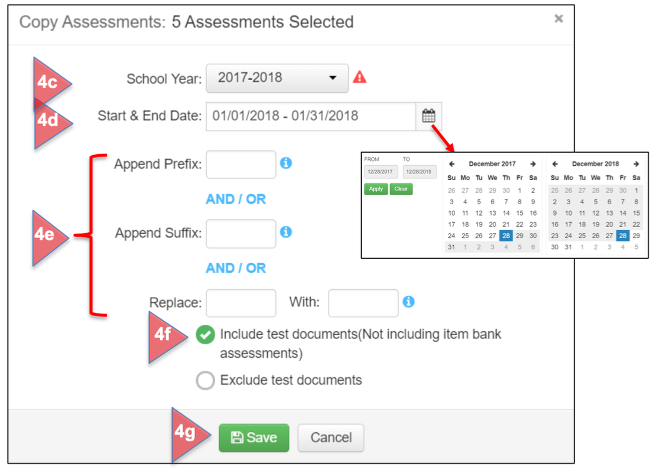 In the Assessment Manager, the newly copied assessments will be found under the selected school year and level in which they were created My Assessments, School, or District.